BCBSA is looking to hire a Provincial Bobsleigh Coach to work out of Whistler for the upcoming season with potential for a longer contract. Now's your chance to learn proper push technique from an Olympic Coach, before bad habits creep in an ruin your chances to become the next Olympic or World Cup Athlete! Three days of training and finish off with a Push Competition on Sunday. The Push Competition will be open to the public ($20. fee for those not enrolled in the Push Camp) Competitors will be taught the basics and get 2 chances to beat or come close to the BCBSA Development Athlete Standards. 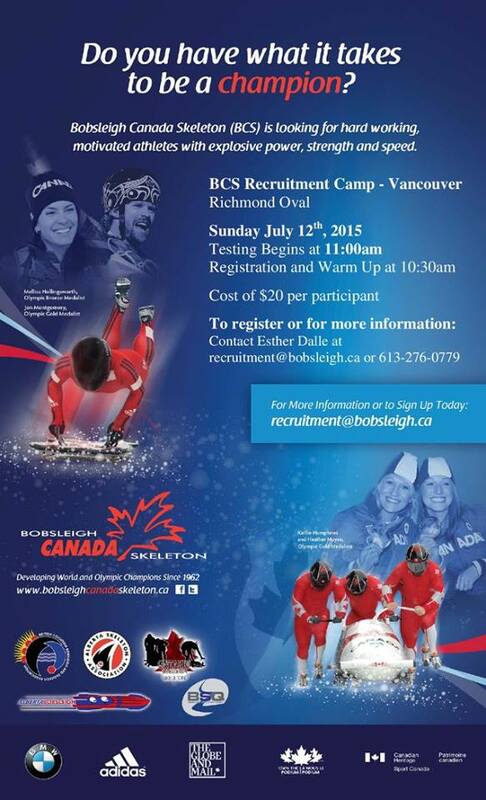 If they meet or beat the time - they will be invited to take part in the next BCBSA Talent ID recruitement testing. Ever wanted to show your friends & family what sliding is really about? Now you can! Are you ready? BC Cup # 3 & 4 is just around the corner!!! Rick Mercer Report visits the Whistler Sliding Centre and the BC Bobsleigh and Skeleton Assoc. ICC & NAC 2015 - Volunteers Needed! Love bobsleigh and skeleton? Ever thought about being track side for all the events and volunteering? So you want to Pilot your own Bobsleigh or Skeleton! You may soon get that chance to get your start in one of the most exciting sports you could ever imagine! Available Now! - We have lots of new programs available for you to get your start at the sports of Bobsleigh and Skeleton. BC Cup #1 & 2 Registration is now open! BC Cup #1 & 2 is open for registration! !